Astaxanthin has 500 times more antioxidant power than vitamin E and is possibly one of the most potent natural antioxidants ever discovered. Astaxanthin`s ability to scavenge free radicals has lead many to believe it may help support the body in protecting itself from the harmful effects of UV radiation and allow users to stay out in the sun longer than is advised using normal spf creams. Research suggests that Astaxanthin has tremendous promise for maintaining healthy eyes, joints and the immune system. Astaxanthin may also help maintain a healthy cardiovascular system. Higher Nature’s Astaxanthin is obtained from an unpolluted source of the aquatic plant, Haematococcus pluvialis. 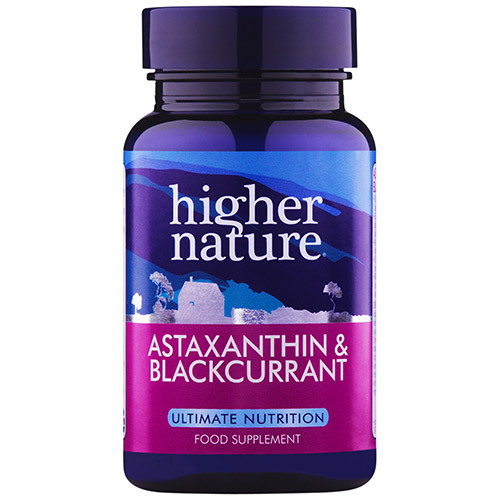 Blackcurrants are an excellent source of anthocyanidins, polyphenols and vitamin C.
Now with added extra antioxidants to protect the potency of the Astaxanthin. Higher Nature`s Astaxanthin is obtained from an unpolluted source of marine algae, Haematococcus pluvialis. This is believed to be the world`s richest known source of Astaxanthin, a unique natural biological antioxidant. Blackcurrants are an excellent source of anthocyanidins, polyphenols and vitamin C.
Tomato powder, vegetarian capsule: hypromellose, colours: red iron oxide, titanium dioxide; blackcurrant fruit extract 4:1, Haematococcus pluvialis (anti-caking agent: silicon dioxide; emulsifier: lecithin (from soya); antioxidants: ascorbyl palmitate, dl-alpha tocopherol), anti-caking agent: silicon dioxide; flow agent: magnesium stearate (vegetarian source); mixed carotenoids, rosemary leaf standardised extract (2-3% carnosic acid). Adults and children over 8 years: Take 2 vegicaps a day with a meal, or as your health professional advises. 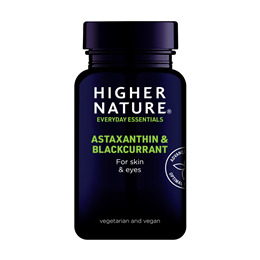 Below are reviews of Astaxanthin and Blackcurrant - 30 x 2mg Vegicaps by bodykind customers. If you have tried this product we'd love to hear what you think so please leave a review. I have taken this product for years and it is beneficial for skin immunity and eyesight. Astaxanthin has 500 times more antioxidant power than vitamin E and is possibly one of the most potent natural antioxidants ever discovered. Blackcurrants are an excellent source of antioxidant anthocyanidins, polyphenols and vitamin C.